Have you ever thought about what would happen if you exceed your liability limits? 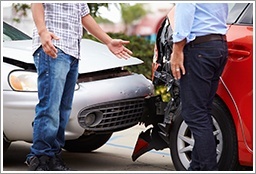 Many people believe that they are good drivers, and therefore do not need a lot of insurance. However, we would like to point out that no driver ever thinks that they are going to have an accident. Yet, in Wisconsin alone there are consistently over 273 accidents per day, and more than one of those accidents will result in a fatality (WI DOT). Though some may take this as the state saying that this level of coverage is good enough, we would never advise anyone to have liability limits so low. In fact, some quality insurance carriers will refuse to write anything lower than 100/300/100. There are many good reasons for this. Perhaps the easiest to understand is the limit for property damage. This coverage would pay for damages to other vehicles, street lights, fences, etc. Now think about your daily commute. How many vehicles do you drive next to every day that are worth more than $10,000? A brand new Ford F-150. A two-year-old Chevy Equinox. Any Lexus, BMW, or Acura. A limit of only $10,000 may not be enough to repair and certainly not enough to replace many of the cars on the road. But when this limit is exhausted, it is not the end of the claim. The owner of the car is going to want the vehicle fixed or replaced, and they are not going to pay for it themselves. When the $10,000 limit is cashed, your bank account and other assets can be used to pay for damages. One way or another, someone else is going to pay for those repairs. Either the liability limits on the policy will be high enough for the insurance carrier to cover the cost, or your savings, assets, and/or future paychecks will. What is harder to understand but is also a bigger threat to your future earnings is the limit for bodily injury. Medical attention and emergency services do not come with price tags. We have a much more difficult time wrapping our heads around how much any type of surgery or doctor’s appointment will cost. However, I can assure you that these expenses can easily exhaust a low limit. Recently, I had a small and planned surgery. I was only under the knife for 45 minutes and only in the hospital for 3 hours. No follow up appointments were required. Want to know what the final bill was to my health insurance? Answer: $22,000. A surprising number, right? Now imagine that instead of a planned surgery, there was an emergency situation – like a car accident. Instead of one person being injured, there were multiple. Instead of a few hours at the hospital, the victims needed a few days, and everyone needed physical therapy and months of follow up appointments with specialist. Can you see how limits of $25,000 per person and $50,000 per accident are not only inadequate, but also extremely dangerous? Just like the owner of the brand new Ford F-150 will not want to pay for his car to be repaired if you are at fault, you can bet that the injured victims of an auto accident are not going to pay for their medical expenses if you are at fault. Once again, either the liability limits on your policy will be high enough for the insurance carrier to cover the cost, or your savings, assets, and/or future paychecks will. For more information please contact your Knowledgebroker. Be sure to ask him or her about your liability limits and if an umbrella policy would be right for you. Bob is the owner of Giovin, Inc. He owns a car that is titled in his name only. He also uses the car primarily for the business of Giovin, Inc. Because of that, Bob had his insurance agent add the car to Giovin Inc.’s commercial automobile policy. Bob even has a lease with Giovin that pays Bob for the use of that car. This seems like a great deal for Bob, and in the real world, this scenario happens fairly often. Let’s say Bob is driving the car on business for Giovin Inc., when he rear ends another car, injuring the occupants. The occupants file a lawsuit against both Bob, personally, and Giovin, Inc. This is when Bob gets a nasty surprise. A standard commercial automobile policy does not cover and defend Bob in this situation. He will have to pay for his own defense in this lawsuit. If there is a judgment or settlement, he will likely have to pay that personally as well. This outcome could have been avoided if Bob had told Giovin’s insurance agent that he was the owner of the vehicle, not Giovin, Inc. This situation can be handled to make sure that Bob is covered under the policy. There are different ways of doing that, and the first step is making your agent aware of who actually owns what vehicle. To be sure, the insurance carrier’s underwriters will have some questions that will need to be answered. A good rule of thumb when it comes to commercial automobile policies: If a vehicle is titled to someone other than the business named in the policy, you need to check with your agent to make sure that the actual owner is covered in case of an accident. Contact a Knowledge Broker at R&R Insurance for additional information.